We wish you a pleasant shopping! 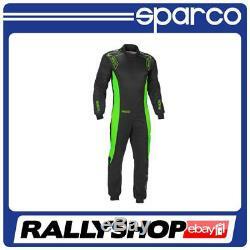 SPARCO Ergo-7 Kart Suit 002304.. Colour: Black - fluo green Homologation: CIK-FIA level 2 approved Reference: 002304. Sparco Ergo-7 kart suit makes use of the innovative design that is also found in the Nomex race suit range. Ergo-7 features a top entry design that includes two zips, one either side of the neck. Highly breathable fabric with large air vents on the shoulders and inner thighs help to keep the body cool during races. Ergonomic suit, specifically studied for driver in a driving position. New fitting system that avoids extra materials on the belt area. New design for the air vents on upper chest, internal thigh and arms. Elastic inserts on back, rear side shoulder and internal thigh for a better mobility and comfort - Bigger space on chest for sponsor brands. Picture For Illustration Purposes Only. We offer you our 10 years of experience and 24h customer service. We have been trading in the Motorsport industry since 2006. Rallyshop supplies racewear, parts and accessories to motorsport competitors, teams, enthusiasts and spectators in the whole world. We stock hundreds of brands including Sparco, OMP, Stilo, Eibach, B2, Ferodo, Peltor, Setrab, Schroth, VDO, Goodridge, KW, Simpson, Sabelt, AP Racing, H&R, Mocal, Powersprint, Spal, Simoni Racing, Tilton, Momo, Bilstein, Sachs, Willwood, ATL and QMS. We offer for example boots. Our race accessory shop offer a friendly, knowledgeable customer service both on site and online. You only have to check our feedback score to see we're the most reliable sellers in Race, Rally and Karting. 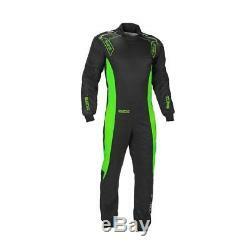 The item "CIK Sparco Ergo-7 Kart Suit M Black fluo Green CHEAP DELIVERY overall" is in sale since Friday, October 13, 2017.